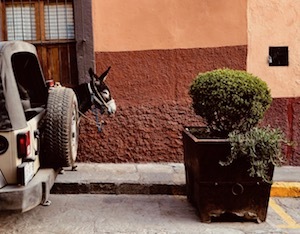 When we arrived in San Miguel de Allende (Mexico) over five months ago, I went on a blogging spree. I was inspired, in part, by the refreshing wonder of fast internet. 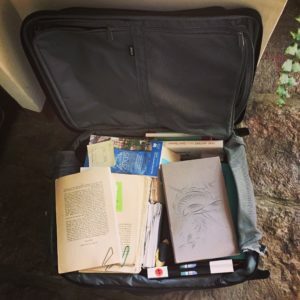 A month later, I stopped writing blog posts, getting down to the business of writing the keynote speech I was to give at the San Miguel Writers’ Conference mid-February. As well, The Shadow Queen had been chosen as the Conference’s “Big Read” and an event was organized presenting it to book clubs. The event ended up including a video interview of me on writing The Shadow Queen, two lively short lectures by experts on the historical period, and a dramatic performance from the novel—plus champagne and authentic French beignets. Being an all-or-nothing sort of person, I got very involved in scripting the film, which you can see here. Denis Lanson, the film-maker, did a wonderful job. The short dramatic performance was my suggestion (in lieu of a reading). I discovered that it was quite a challenge to write. Wonderful actor friends Marilyn Bullivant and Rick Davey performed it. 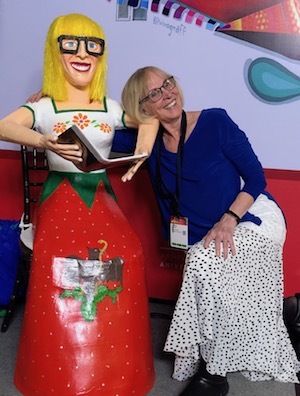 We went through several rehearsals (necessitating rewrites) together with Karen Kinney, head of the committee (a creative committee from heaven, IMO). In short, a good part of December, January and early February was entirely taken up with writing the keynote, preparing readings for several Conference panels, and scripting the film interview and dramatic presentation of The Shadow Queen. All very exciting! On stage before my keynote. The Conference went wonderfully well. I still glow thinking of the reception to my keynote—a standing ovation from an audience of about five hundred—this in addition to the thrill of so many people reading The Shadow Queen. It was a highlight of my life as a writer. 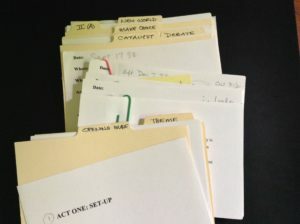 I made a self-appointed deadline mid-April to deliver an outline and character “bible” to Allison McCabe, the wonderful editor of historical fiction who worked with me on The Game of Hope. 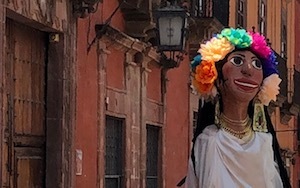 I delivered it Saturday morning, then celebrated with a lunch margarita at Casa Blanca, one of our favourite restaurants in San Miguel this year. The working title of the WIP is now Raptor Wild, which I rather like. The “outline” is a mix of bare-bone scenes (mostly dialogue) and narrative plot points, weighing in at a hefty 14,392 words. 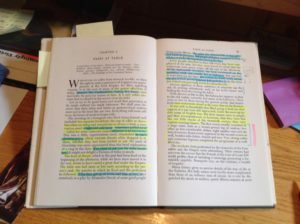 The character “bible” is simply a page or two on each of the thirteen main characters, including a gyrfalcon and an elderly English Water Spaniel. 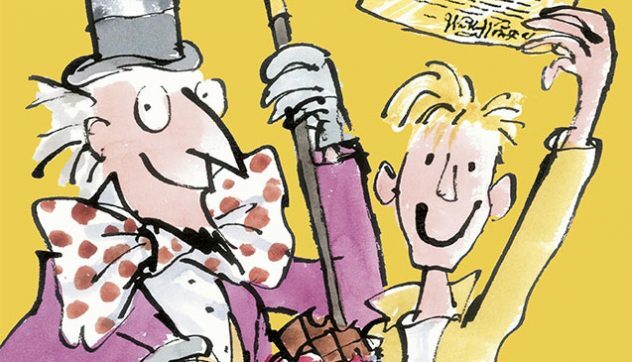 A significant number of the characters die or are killed off rather early on in the story—somewhat too grim for a YA, I suspect. “Beauty,” one of the WIP characters. Although this was only an outline, I developed all the usual symptoms of being in final draft mode. Invariably, at that stage, I become obsessed. I get little sleep, cancel all activities that are not work-related, and become convinced I have a fatal illness. That’s when I think: Ah, almost there. How wonderful to send files off and experience a miraculous cure! 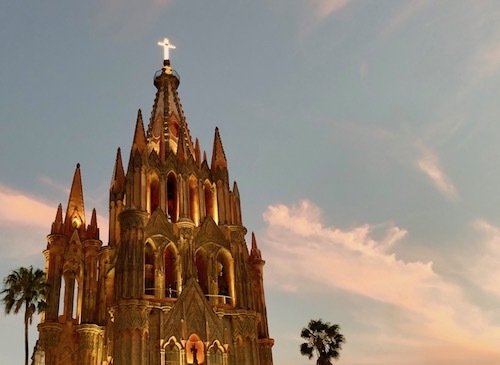 Now that Raptor Wild has been wrapped up (for now), it’s time to prepare to leave San Miguel—never easy. I love getting back home to Canada, but I hate leaving Mexico, too. We’ve had a wonderful winter here this year. 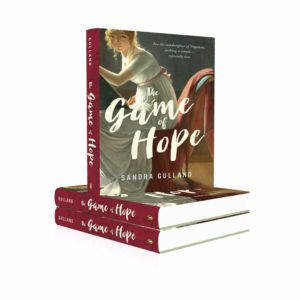 Next up, the paperback release of The Game of Hope, all gussied up in a beautiful new cover! I decided to try to write a logline for my next novel because I had wandered into mucky territory in working on my plot. I’ve attempted this for several of my earlier novels, but never successfully. I can write a 500-page novel, but a one-sentence summary? This turns my brain into a pretzel. The term logline originated in Hollywood. According to some, film producers would get so many scripts to consider that they took to summarizing the story in one sentence and putting it on the spine of the manuscript so that they could easily find what they were looking for. The term “logline” was first used in old Hollywood. The big studios would own hundreds of scripts, and the studio head would keep a log book that recorded concise summaries (or “loglines“) that described each script in the studio’s possession. A logline (sometimes called the “elevator pitch”) summarizes the essence of a story in one sentence (sometimes two) between 20 – 30 words long. How hard can that be? Writing a logline is a good way of discovering the core of your story. 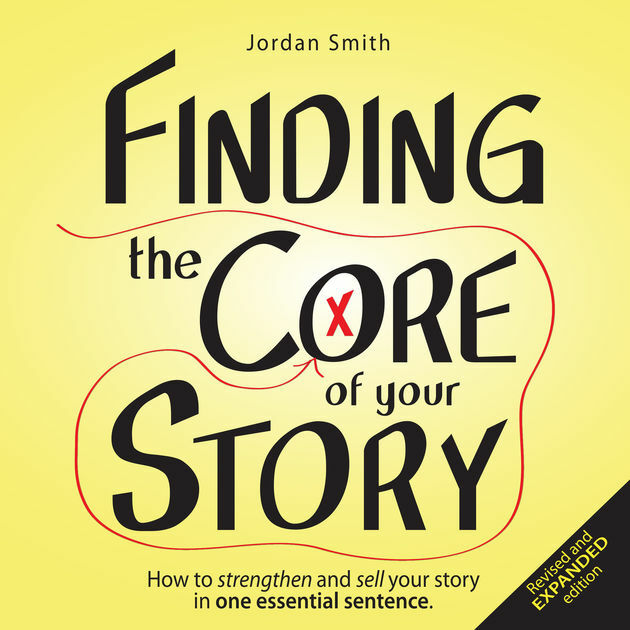 A logline will help you keep focussed on that core while writing the novel. 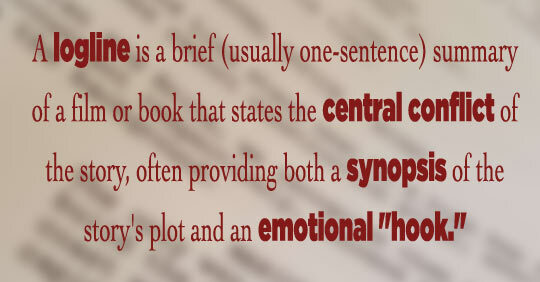 A logline will be useful if pitching your book to an agent or publisher, should you need to do so. A logline will be useful in marketing the novel once it’s published. Yes, I know: it doesn’t quite fit the two-word rule, but I’m going with it. Although “desperate predator” is interesting, “vindictive Master” is clearer. Next step: What does my protagonist want? She wants her father’s respect. She wants him to come out of his depression, get over his grief. She wants to save his life. She wants to solve the mystery of her brothers’ death. She wants to help her father fulfill her dead brothers’ last wish to compete in Queen Elizabeth’s White Falcon Gala. She wants to escape Pete’s murderous vengeance. She wants to save the lives of her raptors. She wants not to be sent to the gallows for having saved them. She wants to be a falconer, to live a life with raptors. She wants to kiss the funny horse whisperer. She wants to prove to the world that her white falcon is exceptional. So: how to choose just one? I began by looking for the one thing that might tie into several others. Let’s give it the “why” test: Why does she want to do this? It would help restore her father’s spirits. It would honour her dead brothers. So it’s a fairly central goal, except for one thing. Competing in Queen Elizabeth’s Gala could mean discovery by the Master, from whom she is fleeing. A feral teen falconer with unusual powers is intent on helping her father honour her dead brothers’ last wish by competing in Queen Elizabeth’s White Falcon Gala, although doing so could mean being sent to the gallows by the vindictive Master. OK. Not bad, although at 41 words it’s far too long. Trimming it back will have to come. Loglines will change over time; they do not have to be written in stone. But now, how to refine it, make it better? using the word must or forced can add urgency. After the suspicious deaths of her two brothers, a feral teen falconer with unusual powers must help her broken-hearted father honour her dead brothers’ last wish by competing in Queen Elizabeth’s White Falcon Gala, although doing so could mean being sent to the gallows by their vindictive Master. After the suspicious deaths of her two brothers, a feral teen falconer with unusual powers must help her broken-hearted father honour her dead brothers’ last wish by competing in Queen Elisabeth’s White Falcon Gala, although doing will likely mean being sent to the gallows by their vindictive Master. After the suspicious deaths of her two brothers, a feral teen falconer with unusual powers must help her broken-hearted father honour her dead brothers’ last wish by competing in Queen Elizabeth’s White Falcon Gala, although doing so will likely mean being sent to the gallows by their vindictive Master. The interesting thing about this exercise is that it solved a few plot problems. Before, competing in the Gala was something that happened almost by chance, which didn’t feel logical, much less dramatic. Also, the danger of discovery by Master Pete was never even considered. Now that possibility adds tension. There are many outstanding plot problems to be solved, including solving the mystery of her brothers’ death and how to dispense with the vengeful Master. Also, perhaps the one hook that’s most of interest to potential readers is that Molly will become Queen Elizabeth’s Master Falconer. You can see how challenging it is to write a logline! 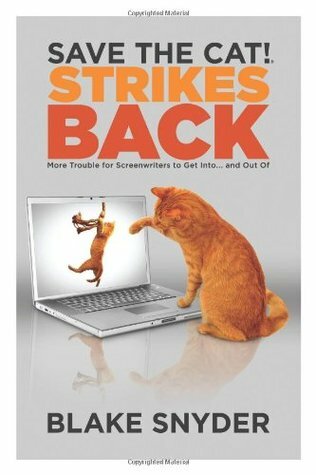 I’m a big fan of Save the Cat by Blake Snyder, and I’m looking forward to reading Save the Cat Strikes Back, which I understand has a chapter on loglines. Speaking of Save the Cat, this post on logline templates for specific genres as defined by Snyder looks interesting. I’ll be exploring it soon. In other words, more to come. I wanted to find out the breed of this bird and to know if it might be one my character in The Next Novel might have had experience with. In other words, what was this bird, and was it common to Elizabethan England? I’d discovered Imperious on the website of Raphael Historical Falconry, and so I wrote to them. This morning, I had a long email from Emma Raphael, giving me a full and very interesting explanation. (People are so very generous with their knowledge!) 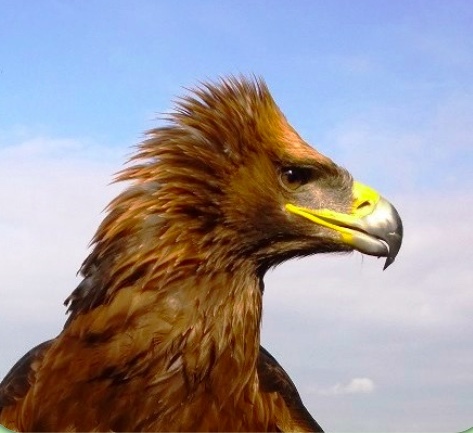 Imperious is a Golden Eagle hybrid, and Eagles were rarely seen in Elizabethan England. In fact, there was only one recorded, in the ruins of an old castle near Chester, and was persecuted by farmers who feared for their young cattle. 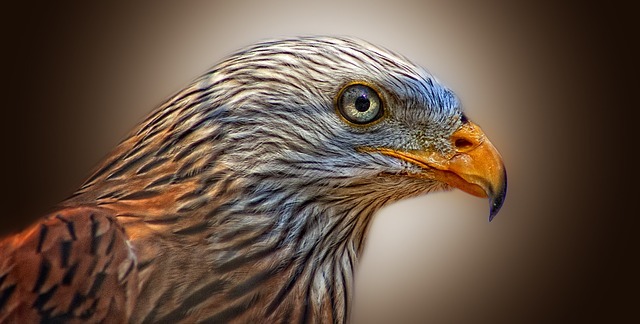 The wild raptor most associated with Elizabethan England, Emma went on to explain, is the Red Kite. They were at their highest population levels ever at this time because of the spread of human settlements and all the open rubbish pits found in towns and villages in which they scavenged. They flocked in their hundreds and could be seen wheeling around the skies like crows whistling and calling. 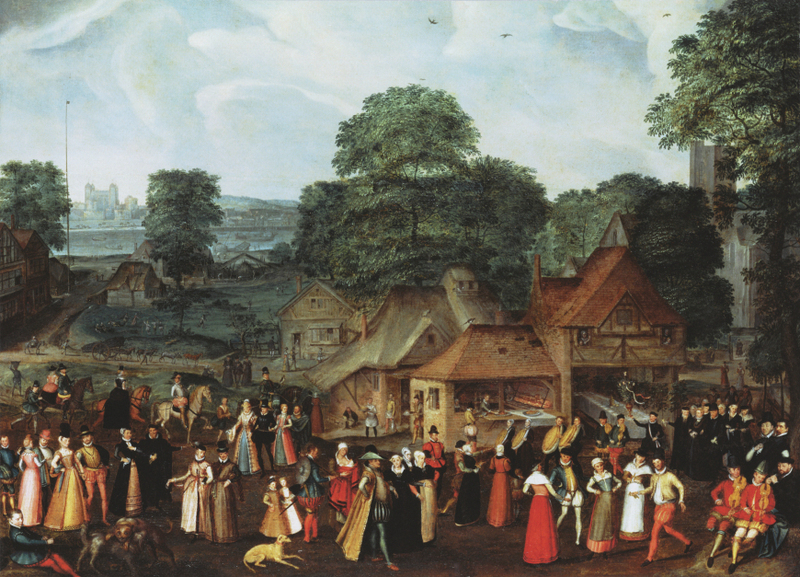 She suggested I look at the painting “The Wedding at Bermondsey” — a painting of a wedding in Elizabethan London. 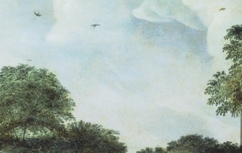 From a detail of the painting, red kites can be seen in the sky. 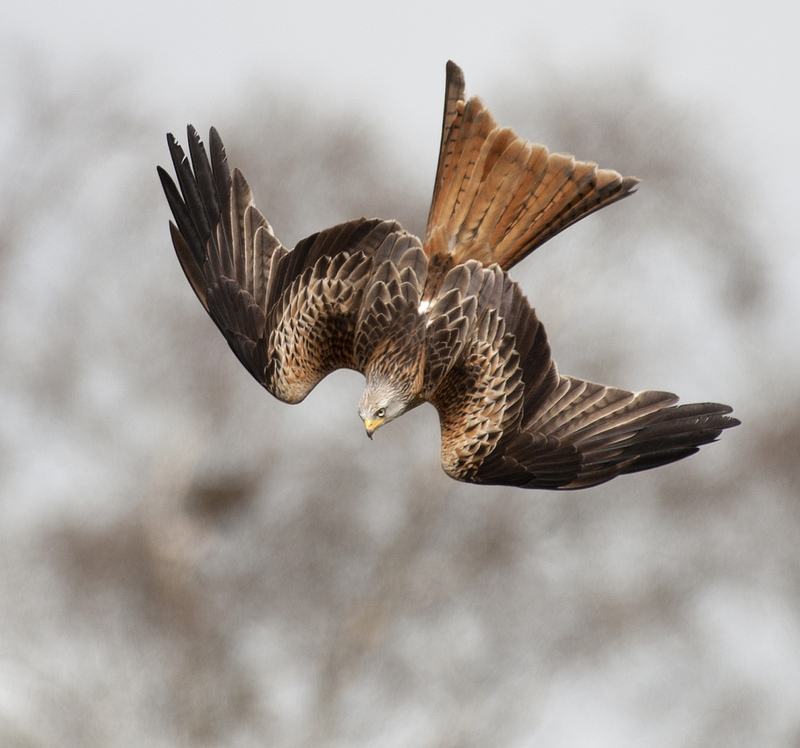 The royals throughout the period hunted kites with Gyr Falcons because they were so numerous and there are lots of accounts of “kite hawking” in Londonshire, Cambridgeshire and Huntingtonshire. Cambridgeshire is the initial location of The Next Novel, and so here, with a simple inquiry about Imperious, I have a wealth of scene possibilities. Additionally, ” Wedding at Bermondsey” is a painting I could get absorbed in for some time. The details are delicious. 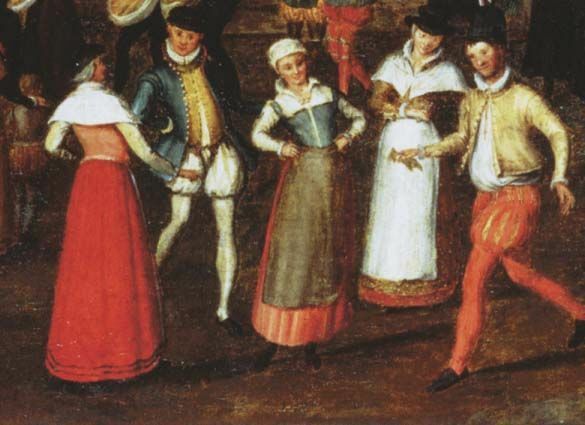 The 16th century is new to me, and I confess that men in bloomers are charmingly captivating. 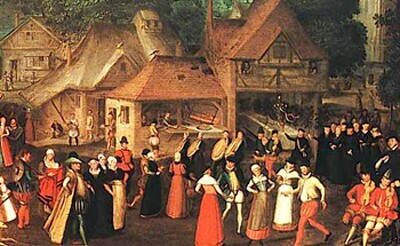 Belgium artist Joris Hoefnagel painted “Wedding at Bermondsey” some time after his visit to the UK in 1569. Worthwhile Google searches: “writing about characters worksheet,” “character development,” etc. On November 2, 2011 (the day before my birthday), my agent, Jackie Kaiser, called to tell me that I’d been made a very tempting offer by Penguin to write two YA novels. One was to be about Josephine’s daughter Hortense, and the second was to be of my choosing. 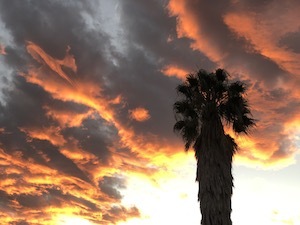 My husband and I were in Mexico at the time, and two nights before I’d told him that I would never again contract to write a book “in advance.” I simply found it too stressful. So the timing was a bit ironic. After Jackie’s call, I told my husband, “I’ve just been made an offer I can’t refuse.” Jackie had emailed me a photo of the box the offer had arrived in. 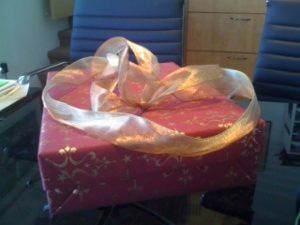 Inside were the contract details and chocolates. How charming was that? Even so, I thought about it carefully for two months. It takes me years (and years!) 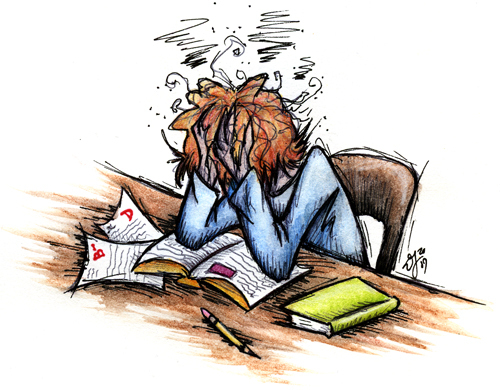 to write a novel, and I have to feel passionate about it. I have to fall in love with it. 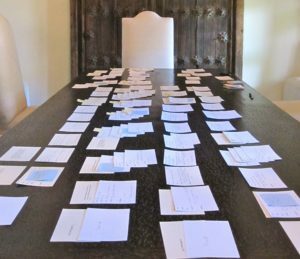 So I reread books about Hortense and covered our dining room table with plot points on index cards, considering. I needed to see if there was a story there, an enchanting story about Hortense’s teen years. Somehow, I feel that I can do all of this all at once: finish This Bright Darkness, begin another adult novel set in the 17th century, write two YAs and a short novel for GoodReads, as well as launch my own e-book imprint. The Shadow Queen was published and my e-book imprint launched, but the “other adult novel set in the 17th century” had to be put on the back burner and the short novel for GoodReads was regretfully abandoned. Writing a novel requires full attention. Soon I was carting research books on Hortense back and forth from Mexico to Canada. 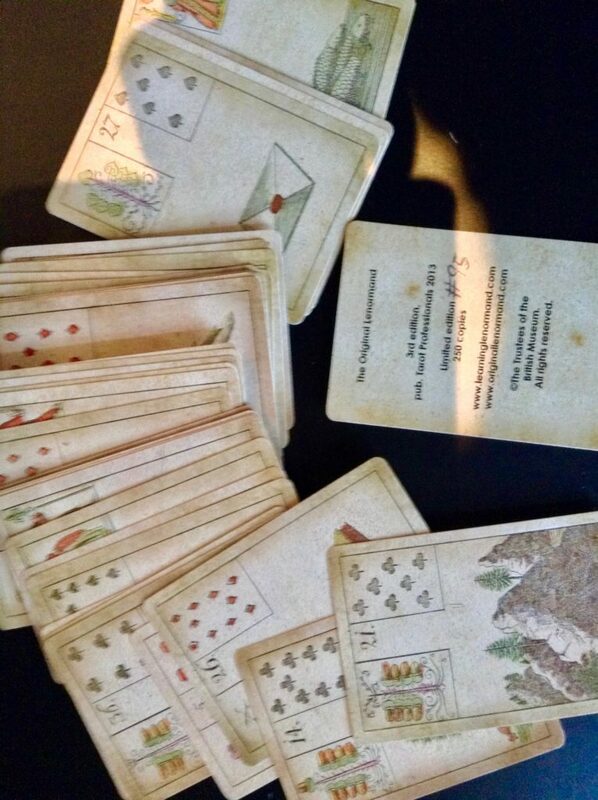 I organized my plot cards, shuffled and re-shuffled them. On November 2, 2013, a full two years after receiving the offer from Penguin, I began the first draft. 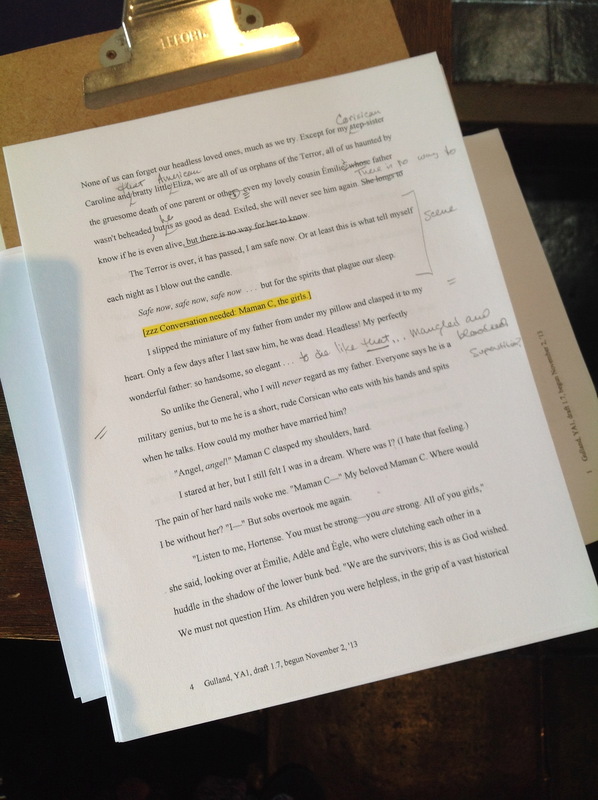 This is draft 1.7 — that is, the 7th draft of the 1st draft. Over the next four years, I made two research trips to France. 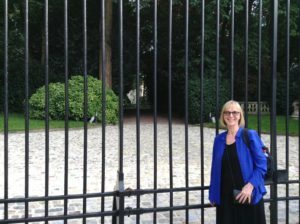 Here I am at the gates to Mortefontaine, the country estate of Napoleon’s brother Joseph. 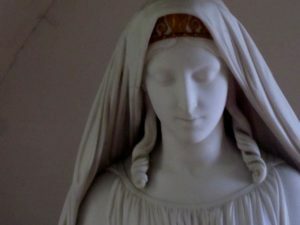 This is a statue of Hortense at her home of exile in Arenenberg, Switzerland, overlooking Lake Constance, now a delightful museum devoted to her memory. 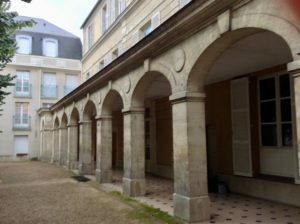 This is a photo of what remains of Madame Campan’s wonderful school in Saint-Germain-en-Laye. 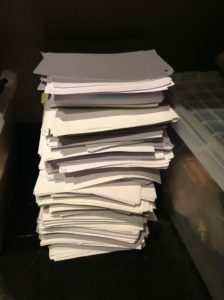 Over time, I had the requisite stack of nine drafts it takes me to write a book. 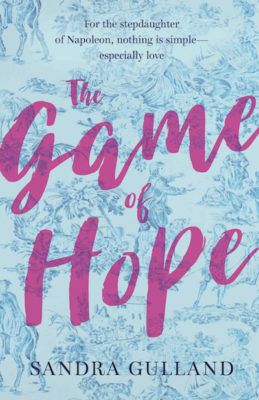 During the four years it took to write The Game of Hope, it went from being a novel told in the present tense to (at a fairly late stage) a novel told in the past tense. The title changed many, many times, and settled, finally, and happily, on The Game of Hope. The cover changed many times as well. 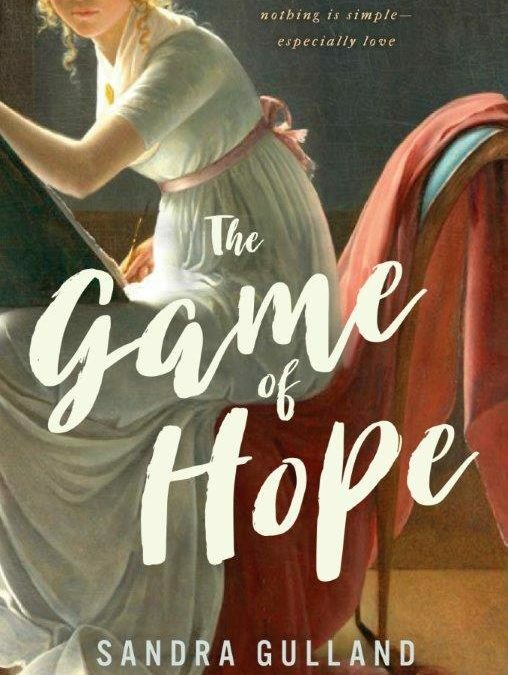 The Game of Hope, Hortense’s story, is now a book. For real. I’ve yet to hold it in my hands, but I will soon, in Toronto on May 1, the official Canadian publication day. The amazement I feel about this long and magical process never grows old. With every newsletter, a subscriber wins one of my books! 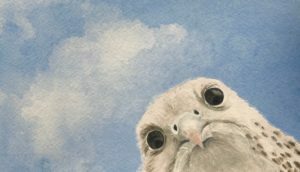 Creative Adventures in Painting — including my raptor series. Sandra Gulland INK, my ebook publishing venture. Sign up for my newsletter for a chance to win a book.